Toastmasters club using the easy-speak web application. Click on This Club->Club Directory for general information about the Quality Speakers club, including how to contact us and where and when we meet. The club does not meet during summer months, however it does meet on holiday Mondays, such as Thanksgiving and Easter. 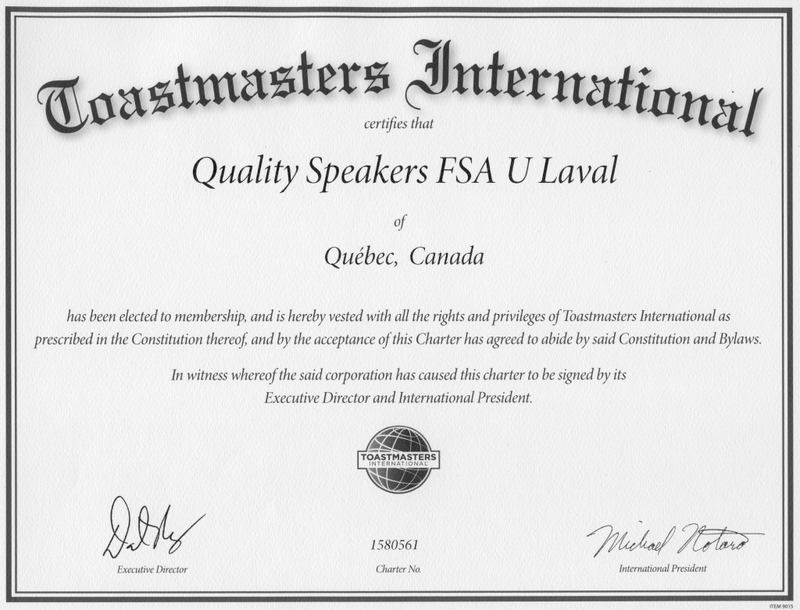 You can also email us at: qualityspeakersfsaulaval@gmail.com and follow us on facebook. Here are some useful links to the organization of Toastmasters clubs. The Toastmasters International web site contains some great videos about public speaking that are quite helpful. Some TED talks are also quite useful to learn more about communication and leadership. Check out some of the TED talks of interest (under the Home menu) recommended by club members. 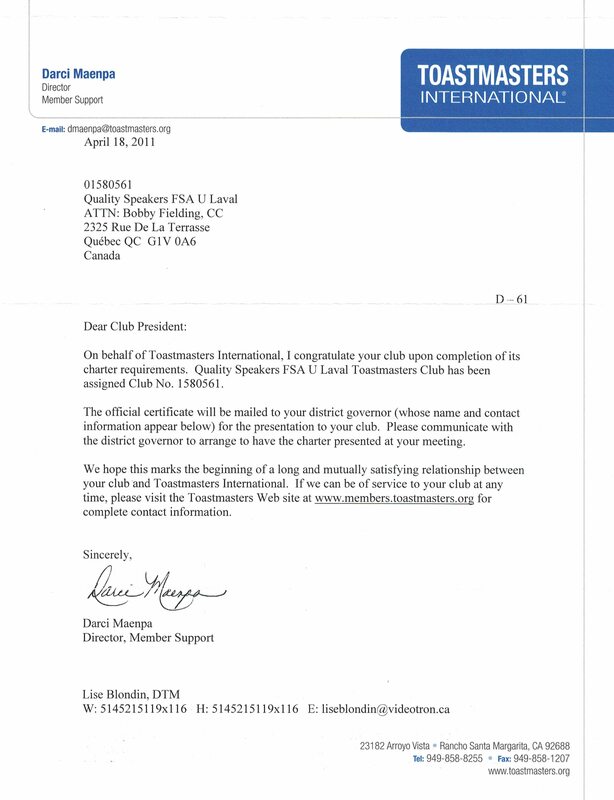 The English/French Glossary of Toastmasters terms can be found on the District 61 translation web site. To help with the pronunciation of English words, go to the Merriam Webster Dictionary web site. For example, check out how to pronounce record when it is a verb versus when it is a noun. Another web site to hear how words are pronounced is Google translate. If you want to verify specific Canadian spelling of words, as different from American or British spelling, this web page on Canadian, American and British Spelling is a good place to start. As a club member, you can log in and manage your own participation in meetings, schedule when a speech will be ready, and much more. You can also see who has already signed up for future roles. Along with the weekly meeting information, you can monitor the speeches you have delivered and are planning to deliver, the leadership projects you have completed, see pictures of club members to put a name to a face and vice versa, as well as get information for each meeting role and club officer roles. Here is a list of basic information to know to get you started. If you have any questions, please contact your mentor or a club officer. A Toastmasters club is a great place to try things out and see the result. It is reported that Thomas Edison failed over 1000 times before coming up with the lightbulb. Did he make 1000 mistakes? Or did he try something out to see the result? "Most things in life aren’t learned when we do them right; they are learned when we make mistakes. It is the club’s job to create a safe environment where the member can make mistakes and then be guided to learn from those mistakes. Being prepared is great, but sometimes it is idealistic. We need to support our members so they can learn and grow." Are you ready for a table topic? The table topics part of the meeting help us practice impromptu speaking, that is short unprepared speechs on a topic that we are given. Check out how to be a table topics speaker and these tips for improving when we are faced with these types of situations. By regularly giving speeches, gaining feedback, leading teams and guiding others to achieve their goals, leaders emerge. They learn to tell their stories. They listen and answer. They plan and lead. They give feedback – and accept it. They find their path to leadership. To get email notifications of updates made to the club's Facebook page, be sure to click on "Like" and then "Get notifications".